Antique Andy’s - "Believe it or Nuts"
This is a story about the hard working American Farmer, an entrepreneurial spirit and a government agency that’s JUST HERE TO HELP YOU. HOUSTON--An industry which will enlarge the agricultural productiveness of the Rio Grande Valley by thousands of dollars annually will shortly be launched at San Benito on the Gulf Coast Lines, according to John Hubler. He has been experimenting with hemp in the Valley and, after a long series of careful tests, declared it can be grown most profitably in that section. Erection of a hemp mill is planned to start this fall, with eastern and northern capital. Mr. Hubler built the plant of the Wisconsin Hemp Co. at Brandon. Wis., which later was sold to the American Hemp & Flax Co. Demand for hemp has outstripped the supply, thereby offering an opportunity in this section. 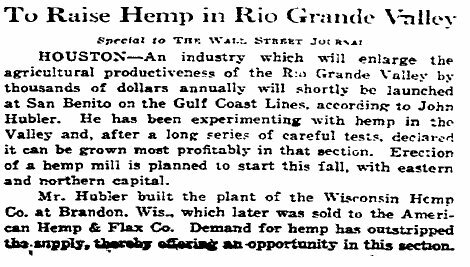 Raymondville, Texas---Experiments in growing hemp in the Lower Rio Grande Valley proved so successful this year that the acreage of the new crop will be considerably increased during the coming crop season. The processing of the hemp into fibre is being done at a mill installed here for the purpose. The bales of 250 pounds each are shipped through Port Isabel to eastern fibre manufacturers. Farmers who planted 1400 acres to hemp along the Rio Grand near Raymondville, Texas, didn’t know that the habit-forming drug marihuana may be gathered from hemp during certain stages of its growth. U.S. Custom’s agents ordered the crop plowed under last year. Seeds carried by the wind re-sowed the field, however and another plowing under was necessary. Customs agents are shown above supervising the job. AH TEXAS, you've have done us all proud!